The abundant waters surrounding the Bass Islands provide some of the best fishing in Lake Erie! Anglers flock from all over the Midwest and beyond to enjoy fishing for the walleye, perch and smallmouth bass, which flourish in Lake Erie’s western shallow basin. While visiting Put-in-Bay, anglers will find many services and products available, which will enhance their overall fishing experience. The Village of Put-in-Bay has dockage available for fishing boats on both A-Dock and C-Dock. Click here to learn more about the Village of Put-in-Bay’s A & C docks. Anglers will find a fish waste receptacle at the South Bass Island State Park, located at the southwest end of the island. Anglers will find public boat launches on the east end of the downtown harbor and at the South Bass Island State Park, which is located on the southwest end of the island. Bait and tackle supplies are available on Put-in-Bay at Erie Islands Petroleum, on Langram Road, Saunder’s Resort, located at the South Bass Island State Park; and The Wharfside, located just west of the harbor. 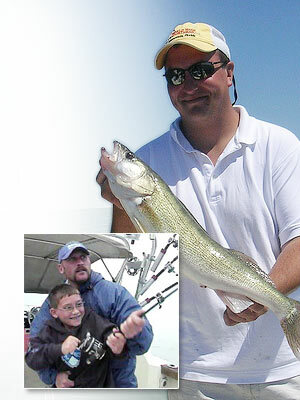 Click here to get the Ohio Department of Natural Resources Weekly Lake Erie Fishing Report.